The consumer conference board does a paper survey every month on consumer confidence. The board's technical notes say (emphasis mine) "The targeted responding sample size - approximately 3,000 completed questionnaires - has remained essentially unchanged throughout the history of the CCI." I called up the board with a simple question: How many surveys do you send out to get 3,000 completed questionnaires? The very snooty person who answered the phone told me to look in the technical notes. However, the information isn't there or I cannot find it. I had already read the technical notes before I called. Besides, my question was quite simple. The Fed places a lot of faith in this survey. Yellen cites strong consumer confidence frequently, as did Bernanke before her. The numbers are out today. 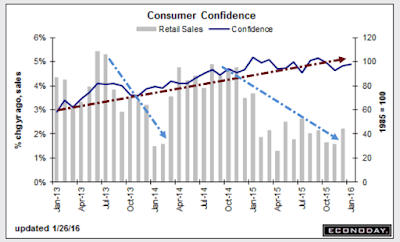 Consumer confidence is up. In general, confidence been high and rising for years. Happy consumers are supposed to be shopping like mad, especially given the collapse in the price of gasoline. Let's investigate those theories from today's Econoday Report. 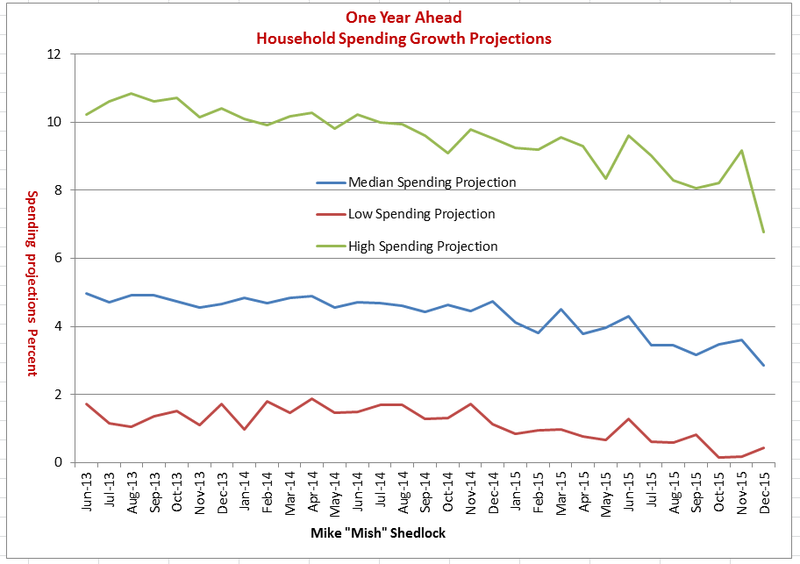 Alleged ties of this survey to consumer spending appear to be a complete bunch of hooey. I keep wondering if paper surveys are part of the problem. Are the people who respond to random paper surveys more likely to be happier than those who don't? The New York Fed also does a survey. Every month, the New York Fed interviews a rolling group of 1200 people to produce a detailed Survey of Consumer Expectations. 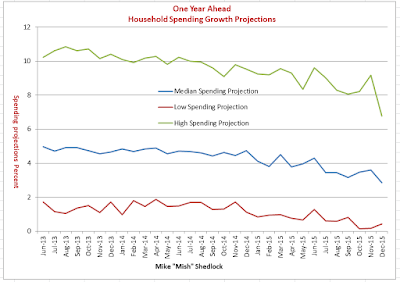 Here are the results of the Fed's latest survey.